You take hours to weigh up and choose a trail camera from a dozen options out there. BUT you realize that no memory card, to be more specific, the SD card is not included. You have to buy it for yourself. Another hour to consider? Fortunately, choosing an SD card for trail camera is less complicated with some small tips. Keep reading to check them out! Why Does Every Trail Camera Use The SD Card? #5. Why should I use MicroSD card and an adaptor instead of the standard SD? #4. Why does the camera say “No SD Card” whereas I already installed one? #3. Why does the SD card have less capacity than advertised? #2. How to format the SD card in my trail camera? #1. What are the best practices to use SD card for trail camera? The SD card, or Security Digital card, is used in digital devices such as cameras, smartphone, music players, etc. to store additional amounts of information. It is also the most common memory card format which comes in different speeds and capacities. In the case of trail cameras, the SD card plays the role of the primary storage source. Naturally, the higher resolution the camera supports, the more space it will take to restore shots. Whereas, a video needs a larger room than a photo. From the trail’s camera description, you can quickly get the information of SD card supported. For example, the manufacturer of Campark Trail Camera T45 recommends using a 32 GB MicroSD card. Sometimes, even a specific brand of card is suggested. If no, do not jump into purchasing a whatever; otherwise, you might waste your spending on poor data recording, corrupt files, or other glitches. Your trail camera has a fantastic 4K video resolution, high photo megapixel, fast trigger speed, far detection range, and good battery life – seems perfect. Yet a bad SD card ruins them all. If you read my post 5 Regular Trail Camera Troubleshooting, then you already know that SD card is the most problematic. A branded card sets you more relax since there are always available supports if you cannot deal with the issues yourselves. SD card for trail camera: Which brand to choose? Not every branded card is costly. There is a wide price range to choose from high-end to affordable cards. The capacity of low-quality cards is often less than advertised. If your memory card has an over-expected life, then you should check carefully. You might also not know some tips to use the SD card for trail camera more effectively. I will share you at the end of this post. So, what brand to spend your money? I often go for major brands such as Kingston, SanDisk, Lexar, Sony, Samsung, or PNY. Speed classes indicate how fast the SD card saves the digital files captured. Almost every modern trail camera now supports both shooting pictures and recording videos at a lightning-fast trigger speed. That time, a fast SD card is essential to record high-quality files and store them directly to the card. There are four speed classes and two Ultra High Speed (UHS) speed classes. You should avoid the Class 2 cards since they are on the slow side these days. When it comes to trail camera, SD cards with Class 4 or 6 are acceptable so that you can record high-definition videos. Class 10 is the fastest speed class, which is ideal for recording full HD videos or HD still consecutive videos. Two UHS speed classes are very fast, but far more expensive. These SD cards are usually designed for professional use. To be short, the SD card for trail camera must meet the minimum class required by the camera’s manufacturer. Higher speed class is strongly recommended. Besides speed classes, SD cards vary in their capacity, which often ranges from 128MB up to 2TB. You should use the capacity recommended by the manufacturer. Naturally, they know their trail cameras the best right? Here are three types of SD card you might use. The standard often supports a storage space between 128MB to 2GB – Quite small. 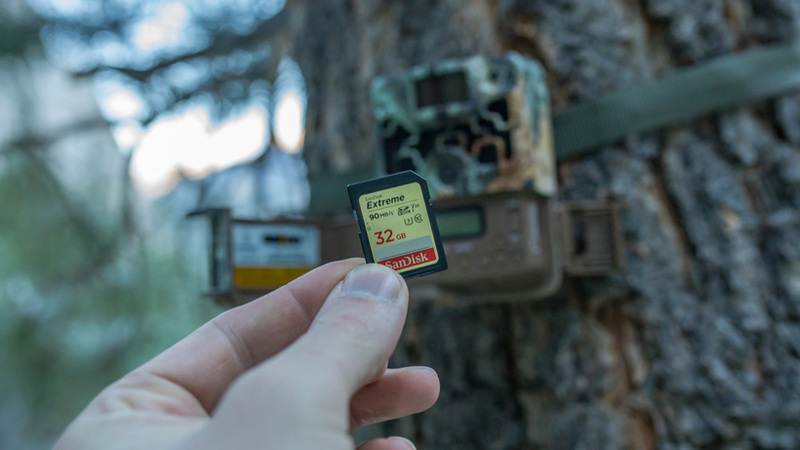 Cheap trail cameras often use this type of SD card. If you use the camera to take photos of a short even or you mount the camera in or near your house for frequent checks, this capacity is acceptable. These days, most trail cameras support up to 32MB capacity. Thus, the SDHC seems more suitable than the Standard SD. You not only have more room for videos and photos storage but this memory card also keeps up with the fast trigger speed and quick recovery times. This is useful when recording full HD videos. SDXC has the capacities of 64BG – 2TB (definitely not the limitation) with the UHS speed class as above. I bet this SD card will become a new common soon, very soon. New trail cameras are introduced with high resolution and fantastic features almost daily. And, the higher resolution they support, the more quickly they fill the memory cards. “What style of sd card do I need for trail camera?” – wondered you. Over the years, the SD card has shrunk down in size. Now it turns to have three different sizes: Standard, Mini, and Micro. The performance remains the same. Back then, almost all trail cameras used a standard size SD card whose dimensions are 32x24x2.1 mm. I love this size – easy to handle in and out of the camera. However, the microSD size card has become more and more popular, especially among famous brands. Its dimension is 15x11x1 mm. I still find this baby-sized SD card hard to manage, especially with my big fingers and in winter. Luckily, the Micro SD cards are versatile and flexible for various devices. When using a MicroSD card for a trail camera, I often buy an additional adapter. MiniSD card coming at 21.5x20x1.4 mm is the least common size. I hardly see a trail camera with this SD card. So I will not mention much about it here. Let’s countdown the most concerns of buyers when it comes to choosing a trail camera SD card. Though MicroSD card is hard to put in and out the trail camera, I find that using a MicroSD along with an Adaptor is sometimes more economical than buying a Standard SD. Also, it becomes easier to handle with the MicroSD. When it comes to checking videos and photos, I could use the MicroSD directly in my mobile devices such as smartphones or tablets. First, does the card meet the manufacturer’s requirement? Second, check whether the SD card fits the memory card slot yet. Third, try another SD card. If that card is still available, you may try reformatting the SD card. If the issue is not resolved, you should lend a helping hand from those understanding much about trail camera and SD card, like the manufacturer. Your SD card is not formatted yet. On the other hand, if the difference is significant, you should contact the manufacturer for a fix, exchange or even return. Whether it is the first time you use the SD card for trail camera or reinstall it, I recommend to format it first. This is an easy task with your camera by inserting the card and go to Menu ⇒ Set up ⇒ Delete All Function/Format Card. Also, remember to backup data before formatting. Here is the checklist to use your SD card more effectively and keep you relaxing from memory most troubleshooting. Above is some sharings on SD card for trail camera – how to choose & use the card effectively. Now you are ready to buy the most suitable card and get your camera works perfectly as wished.